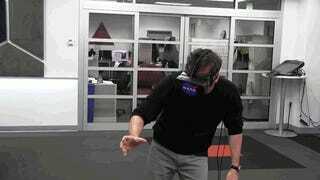 Not content with putting a man on the moon and Tang in our lunch boxes, the folks at NASA have pushed us one step further into the singularity, using an Oculus Rift and the new, more powerful Kinect. Gaze in horror as the folks at NASA's Jet Propulsion Lab fuse man and machine to create a horrifying VR, Robonaut foretold in stories of old. Or, you know, experiment with cool human-machine interfaces. Either way, Daisy is stuck in my head now.